The AC1200 MU-MIMO WiFi Router delivers high performance wireless speed and coverage throughout your home. 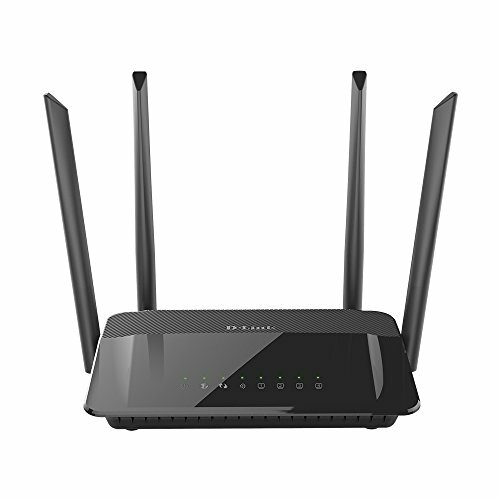 It delivers up to 1,200 Mbps (300 Mbps in 2.4GHz + 867 Mbps in 5GHz) in combined Wi-Fi speed. It comes with Intelligent Quality of Service (QoS) with traffic prioritization, four high-performance external antennas for maximum range, and a new user interface with an easy setup. The DIR-842 is the perfect combination of performance and ease of use. It is ideal for today’s most demanding tasks such as HD streaming, gaming, and multiple device usage. The AC1200 MU-MIMO Wireless Router delivers dual band performance for intelligent, versatile, interference-free bandwidth. Check your email and surf the internet on the 2.4GHz band; and game, make skype calls and stream HD movies on the cleaner, less interference 5GHz band. The DIR-842 also comes with four high-performance antennas to deliver maximum range around your home. The DIR-842 internet router is designed to support MU-MIMO (Multi-User Multiple Input Multiple Output) technology that allows multiple devices to get high-bandwidth Wi-Fi signal at the same time. You can stream HD media faster and play lag-free gaming. Compared to SU-MIMO (Single-User Multiple Input Multiple Output) technology, MU-MIMO distributes data more efficiently, giving you the fastest Wi-Fi speeds in your home.